Our Faithful, friends and benefactors have wondered and asked themselves why we open a Chapel under the title and patronage of Our Lady of Victory, or the title of Maria Victrix, in English: Mary, the Victress. Why did we choose the title of Our Lady of Victory? In this newsletter we would like to line out our reasons for it; however, in order to do so we must draw the bigger picture. 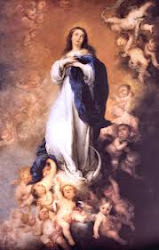 However, the blessed Virgin Mary is not only appearing in different places in order to counteract the devil's plan, she is also stating very clearly that she is engaging in the final and decisive battle with the devil. “Father, the devil is in the mood for engaging in a decisive battle against the Blessed Virgin, and the devil knows what it is that most offends God, and which in a short space of time will gain for him the greatest number of souls. Thus the devil does everything to overcome souls consecrated to God, because in this way the devil will succeed in leaving the souls of the faithful abandoned by their leaders, thereby the more easily will he seize them. “Father, the Most Holy Virgin did not tell me that we are in the last times of the world, but She made me understand this for three reasons. The first reason is because She told me that the devil is in the mood for engaging in a decisive battle against the Virgin. And a decisive battle is the final battle where one side will be victorious and the other side will suffer defeat. Hence from now on we must choose sides. Either we are for God or we are for the devil; there is no other possibility. “The second reason is because She said to my cousins as well as to myself, that God is giving two last remedies to the world. 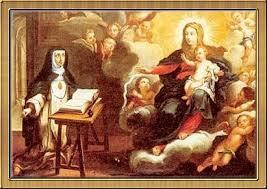 They are the Holy Rosary and devotion to the Immaculate Heart of Mary. These are the two last reme­dies which signify that there will be no others. “The two means for saving the world are prayer and sacrifice. [Regarding the Holy Rosary, Sister Lucy said:] Look, Father, the Most Holy Virgin, in these last times in which we live, has given a new efficacy to the recitation of the Rosary to such an extent that there is no problem, no matter how difficult it is, whether temporal or above all spiritual, in the personal life of each one of us, of our families, of the families of the world or of the religious communities, or even of the life of peoples or nations, that cannot be solved by the Rosary. There is no problem, I tell you, no matter how difficult it is, that we cannot resolve by the prayer of the Holy Rosary. With the Holy Rosary we will sanctify ourselves. We will console Our Lord and obtain the salvation of many souls. We are establishing Our Lady of Victory Chapel in the Cincinnati area in order to stress and point out that Our Lady truly is engaged in this battle against the devil and his helpers. At Our Lady of Victory Chapel we would like to bring as many people as possible to a true understanding of the message of Fatima and its consequences, since we came to the realization that even many traditional organizations and clergy do not promote this important message in all its parts and impacts. The preaching and the practical application of the message of Fatima, which consists of three essential parts, namely, prayer, reparation and consecration to the Immaculate Heart of Mary, will be an essential part of our work at Our Lady of Victory Chapel. 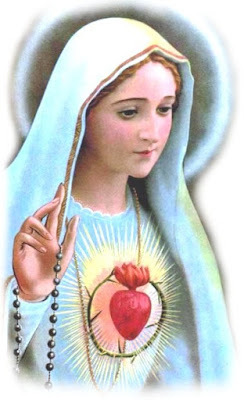 We would like to help Our Blessed Lady with our very modest means of prayer and sacrifice to hasten the Triumph and Victory of Her Immaculate Heart over Satan and his helpers in society and church by doing what she asked of her children in her apparitions of the 19th and 20th centuries, particularly in her apparition at Fatima, and to establish a place belonging totally to Our Lady where she can grant many graces for the conversion, salvation and sanctification of many souls. This mediation of grace of Our Blessed Lady is connected to our main reason and inspiration for the establishment of this chapel. We were much inspired to dedicate our chapel to Our Lady of Victory by the story of the Church and later on Basilica of Notre-Dame des Victoires, Our Lady of Victo­ries in Paris, and therefore our own chapel will be named after this well known shrine church of Our Lady of Victories in Paris. As to that church's origin, history tells us that King Louis XIII made a vow in 1620 that if his troops were successful in ousting the Protestants (Huguenots) from their fortress in La Rochelle, he would build a church in honor of the Virgin Mary. After the victory, a site for the church was chosen on the property of the Discalced Hermits of St. Augustine in Paris. Louis laid the first stone himself, one that was inscribed with a dedication to Our Lady of Victories, on September 9, 1629. The church building was completed only in 1740. In 1630, a poor laborer entered the Augustinian church and took the name Brother Fiacre. He took up residence at the shrine and lived there until his death in 1684. 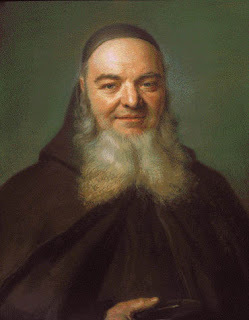 Brother Fiacre was renowned as a mystic. 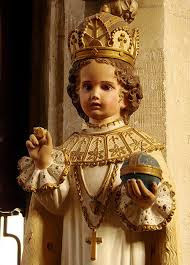 He prayed before the image of Our Lady of Victories for the birth of the future heir to the throne long awaited for 15 years: Louis Diedonne, the future Louis XIV. Brother Fiacre had a vision of the Virgin Mary in 1637, when Mary asked him to tell the King that he would soon be blessed with a son who would inherit his throne. Louis XIV was born on February 10, 1638 and, in thanksgiving, his father consecrated France and the royal family to the Blessed Virgin. God's designs were greater and his victories are much more important for His children, obtained through the intercession of His Holy Mother. The Blessed Mother chose this place to bring to God her dispersed children separated because of sin and its consequences. Brother Fiacre, returning from a pilgrimage to Savona (Italy), started invoking Our Lady of Victories under the title “Refúgium peccatórum,” “Refuge of sinners,” which will have later on a great significance. During the French Revolution terror was extended throughout France. The Augustinians were expelled from their convent and the Church was established as a place for money exchange. Many things changed with Napoleon who due to political interests wanted to appear as a friend of the Church. Between 1800 and 1809 the church was re-erected as a parish, but because it was located in a business neighborhood and lack of Faith was a fruit of the revolution, the church had very little attendance. Human efforts did not help the situation. The church was open but the hearts of men were away from God. This was the state of things on Au­gust 27, 1832, when Father Charles Éléonore Dufriche Desgenettes was in­stalled Pastor of Our Lady of Victories, Paris. The church was abandoned and poor. The spiritual state of the parish which consisted of 15,000 souls, was so decadent that the following Sunday the priest counted on only 4 persons with the choir and during the entire year of 1835 only 720 Holy Communions were distributed. “If the Lord was going to judge me today, how would he find me?” Perhaps as a failure? Has there been a priest so sterile in his ministry like me? The priest asked himself interiorly all these questions. This interior thought in his mind became a lance that pierced his heart. His mind was only on this to the point of not being able to concentrate on the rest of the Mass prayers. Finally, he concluded that presenting his resignation as Pastor would be best. “consecrate your parish to the holy and immaculate heart of mary and establish the confraternity of the most holy and immaculate heart of Mary for the conversion of sinners.” He looked around in order to see whether there was anybody in the church, but there was nobody except the altar server, who was playing with his fingers. The words he heard resounded in his heart, and immediately he had great interior peace. The obsessive thoughts he had moments before disappeared. After concluding Mass and during the time of thanksgiving, he reviewed in his mind all that had happened, saying to himself: “Perhaps all this is just a fantasy produced by my imagination.” During his thanksgiving he heard the words again clearly: “consecrate your parish to the holy and immaculate heart of mary and establish the confraternity of the most holy and immaculate heart of Mary for the conversion of sinners.” He fell to his knees before these words, but was fearful of accepting them as authentic since he thought it was an illusion. He tried to ignore and forget them, but the words returned to his mind with more intensity. Finally, he decided to respond to the petition more so to acquire interior peace than to think it would prove successful for his parish. He resolved to fully obey the request. It was evident that the purpose of the consecration of his parish to the Immaculate Heart of Mary was to motivate the parishioners to pray to the Immaculate Heart and frequently seek recourse to the protection and maternal care of the Blessed Virgin. He thought the best way to establish this was to form a religious association in the form of a confraternity with specific prayers, meetings and norms. In only eight days Father Desgenettes had both written the statues for the confraternity and obtained their approval by the Archbishop of Paris. 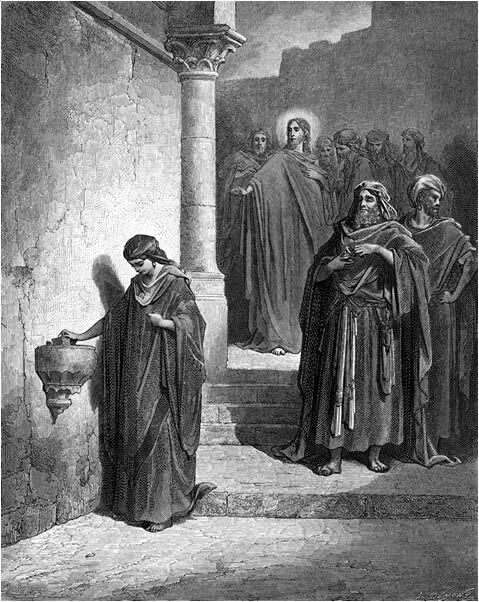 On Sunday, December 11, only 40 women attended his Mass on this Sunday, he announced from the pulpit that beginning with that same afternoon during Vespers special prayers and devotions would be said asking the Lord, through the intercession of the Immaculate Heart of Mary, for the conversion of sinners. The priest did not think many people were going to attend. But the Blessed Virgin Mary started to reveal her plan. After Mass two men who had never at­tended Mass approached Father Desgenettes and requested the Sacrament of Confession. At 6:00 pm, the time announced for Vespers and for the prayers and devotions to the Immaculate Heart of Mary, 400-500 people made their presence in the Church. Everyone was surprised and could not believe the amount of people present. No more than 10 people had been seen in the parish for many years. 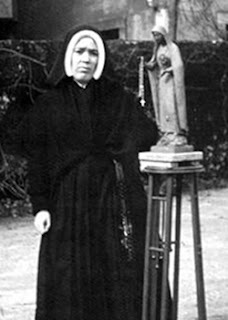 At the beginning of the ceremony, Father Desgenettes went up to the pulpit and announced the Consecration to the Most Holy and Immaculate Heart of Mary and the establishment of a confraternity for the conversion of sinners and announced its statues. At the beginning of the prayers, some were indiffer­ent, but as the prayers and devotions continued, their hearts gradually started to melt under the fire of the Maternal Heart of Mary. At the end the Litany of Our Lady was chanted, and when it came to the invocation of the litany “Refuge of sinners,” all fell on their knees and repeated the same invoca­tion three times, “Refuge of sinners, pray for us, Refuge of sinners, pray for us, Refuge of sinners, pray for us.” The service concluded with the Divine Praises before the Blessed Sacrament. Everyone decided to return to the church and participate in these devotions which animated their Faith and brought back peace and joy to their hearts. The Pastor, Father Desgenettes, was very emotional, but not completely convinced that this way given by Our Lord and directed towards the Heart of Mary had all the necessary results. 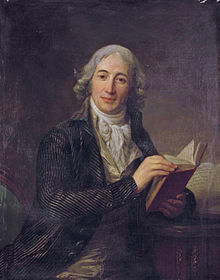 The priest asked the Virgin for a sign, for the conversion of Monsieur Etienne-Louis-Hector de Joly, a fervent Voltairian who was the last holder of the seals of Louis XVI. In his youth this man accepted anti-clerical doctrine and was against the Roman Catholic Church. He was then 80 years old, blind and very ill, and for many years he had refused to practice any religion. Father Desgenettes had tried many times to get closer to Monsieur de Joly, but his attempts were unsuccessful. On December 12, Father Desgenettes returned to Monsieur de Joly's house. The servants did not want to let him into the house, but the priest insisted again and was able to reach the elderly man. Only a few courteous words had been spoken when Monsieur de Joly asked the priest for his blessing. Profoundly moved, the priest blessed him and at that moment the elderly man exclaimed: “Your visit has been so good for me, Father! I cannot see you, but I feel your presence. The moment you entered my room I felt peace, interior calm, and a joy I have never experienced before.” The priest, seeing the good disposition of Monsieur de Joly, asked if he wanted to confess his sins. The elderly man immediately agreed. The miracle happened after a few minutes of conversation, this soul opened to grace - the conversion was instantaneous and the requested sign was given to Father Desgenettes. Father Desgenettes asked for a sign and received it clearly. Now he was convinced that he was doing the Will of God and that he had a mission to accomplish. He encountered many obstacles, like all of God's work, but the Confraternity immediately flourished after it was canonically established on December 16th. In ten days, 214 people became members. The Confraternity continued growing gradually and extended throughout Paris, later throughout the rest of France and the entire world. By spring of 1838, the extraordinary history of the Confraternity in obtaining great conver­sions, miracles and innumerable graces, reached the attention of the Holy Fa­ther. Impressed by the idea of the Confraternity's fruits, Pope Gregory XVI issued a report erecting perpetually in the church of Our Lady of Victories the Confraternity of the Blessed and Immaculate Heart of Mary, for the conver­sion of sinners. 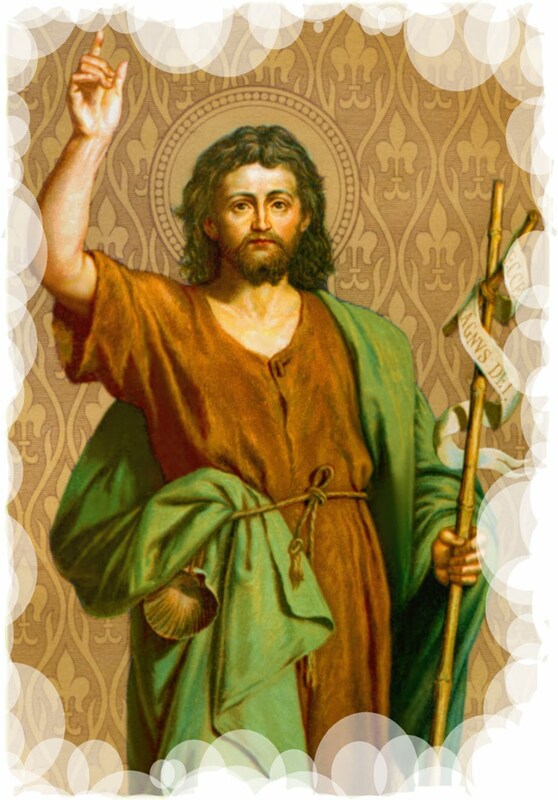 The humble and small Confraternity which started in the midst of a poor parish has become a worldwide spiritual organization, recognized officially, with its See in Paris. 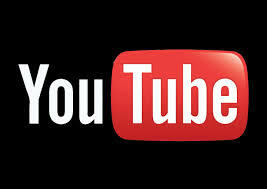 Also, there are many affiliated members around the world. 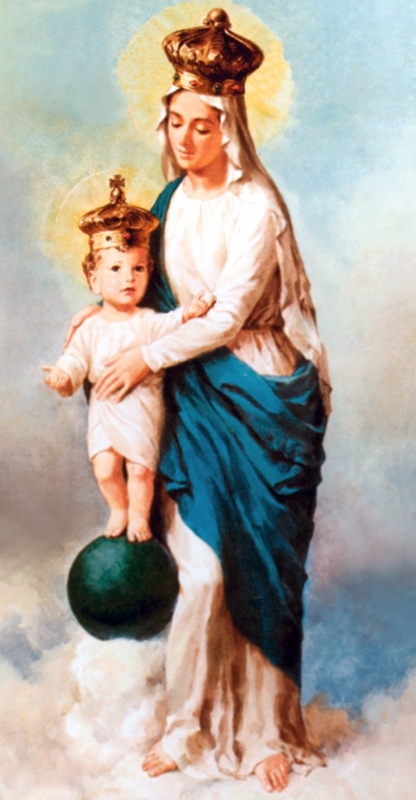 Just as the Miraculous Medal, through Papal approval, Our Lady of Victories, with its official Confraternity, became a global precursor of the Fatima apparitions; the main promoter of the devotion and consecration to the Immaculate Heart of Mary. The successes of the Confraternity are its spiritual fruits, therefore it is diffi­cult to count them. But the fruits seen in the parish are evident where the consecration and the Confraternity started. In only two years the distribution of Communion grew from 720 in 1835 to 8,550 in 1837. In a letter dated from June 1837, Father Desgenettes wrote, “Countless sensational conversions have taken place, and most are of men between the ages of twenty and thirty. My parish was the center of indifference and impiety. Well! It has given me astonishing consolations. In my whole life I never heard as many confessions as I have since last December. Among the neophytes I count several systematic atheists, former Carbonari, Saint-Simonianists (revolutionary factions) … All live as Christians today, many leading an angelic life.” On April 24, 1838, Pope Gregory XVI raised the Confraternity to an Archconfraternity. From then on, it could include Faithful and Catholic communities from around the world. When Father Desgenettes died in 1860, more than 800,000 individuals had registered in the Archconfraternity, and some 14,000 Catholic communities (parishes, congregations, schools) were enrolled. 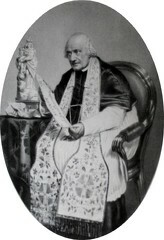 In 1845, the Curé ďArs asked for his parish to be registered. In truth, Father Vianney had preceded his confrère in consecrating his parish to the Immaculate Heart of Mary; he had done so on May 1, 1836, seven months before Father Des­genettes. Nonetheless he humbly asked the Archconfraternity to accept his parish Ars. Because of the extraordinary conversions and graces in the Parish of Our Lady of Victories through the consecration to the Immaculate Heart, and the rapid growth of the Confraternity of the Blessed and Immaculate Heart of Mary for conversion of sinners, which is witnessed by the 37,000 votive offerings and ex-voto plaques, it became the second greatest Marian manifestation after Rue du Bac (where the Miraculous Medal was given) within the divine plan to promote devotion to the Immaculate Heart of Mary. The Church of Our Lady of Victories in Paris was erected as a Basilica in 1927. What do we intend with the founding and the establishment of Our Lady of Victory Roman Catholic Chapel in the Cincinnati area. Do we just want to establish another Traditional Chapel as so many others in the Cincinnati area? Our answer can only be in the negative. What are then the reasons and characteristics for the founding of our chapel? 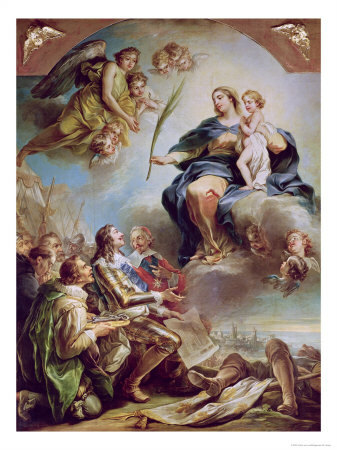 - Our Lady of Victory would like to provide a true Catholic answer to the “Crisis of the Church” or the general Apostasy from the True Catholic Faith by a very profound exposure and explanation of the nature and causes of the “Crisis of the Church,” by sermons, conferences and instruction. - Our Lady of Victory would like to provide a Traditional Roman Catholic Chapel with a strong emphasis on the Devotion to the Blessed Virgin Mary. It shall be a haven of peace and tranquility for the Faithful who want simply to be true uncompromising Catholics or become such, a place where the True Mass is frequently offered and the true Sacraments are administered, and a place where Our Lord Jesus Christ can erect his Throne by His true and sacramental presence in the Holy Eucharist. - Our Lady of Victory would like to promote and explain, as stated above, the essence of the very important message of Fatima in all its integral parts, which could be summarized by the three essential parts of Prayer, Reparation and Consecration. Furthermore, it would like to show the consequences and impacts of this message for society and the Church. Our commitment to the message of Fatima will furthermore be put forth by an active Lay Apostolate realized by the founding of the Apostolate of the Immaculate Heart of Mary and by the founding of the Confraternity of the Most Holy and Immaculate Heart of Mary and its activities. 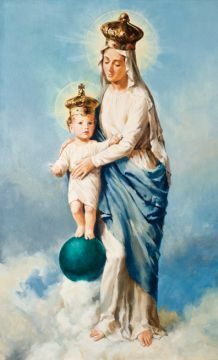 - Furthermore, Our Lady of Victory would like to become a true home where the requests of Our Blessed Lady at Fatima will be put into practice by the frequent recitation of the Rosary before the Blessed Sacrament exposed, by the keeping of the First Saturdays of Reparation, by special services and devotions at Our Lady of Victory Chapel, by the keeping of the Fatima Days, the 13th of each month, and by instruction and explanation of the essence of the personal Consecration to the Immaculate Heart of Mary. May God Bless you and Mary Victress keep! O Mary, merciful Refuge of Sinners and Mother of all mankind! Behold how many souls are lost every hour, Behold how countless millions of those who live in India, in China, and in barbarous regions do not yet know Our Lord Jesus Christ! See, too, how many others are far from the bosom of Mother Church which is Catholic, Apostolic, and Roman! O Mary ... life of our hearts ... let not the Precious Blood and fruits of Redemption be lost for so many souls! Grant that a ray of Heavenly light may shine forth to enlighten those many blinded understandings and to enkindle so many cold hearts. 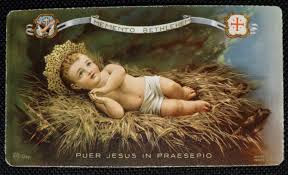 Intercede with thy Divine Son, and obtain grace for all pagans, Jews, heretics, and schismatics in the whole world to receive supernatural light and to enter with joy into the bosom of the true Church. Hear the confident prayer of the Supreme Pontiff that all nations may be united in one faith, that they may know and love Jesus Christ, the blessed fruit of thy womb... And then all men shall love thee also, thou who art the salvation of the world, arbiter and dispenser of the treasures of God ... And, glorifying thee, O Queen of Victories, who, by means of thy Rosary, dost trample upon all heresies, they shall acknowledge that thou givest life to all nations, since there must be a fulfillment of the prophecy: “All generations shall call me blessed.” Amen.